With the Pole Pruner attachment, you can increase the working height to up to 4 metres, so it is even possible to reach high-up branches. 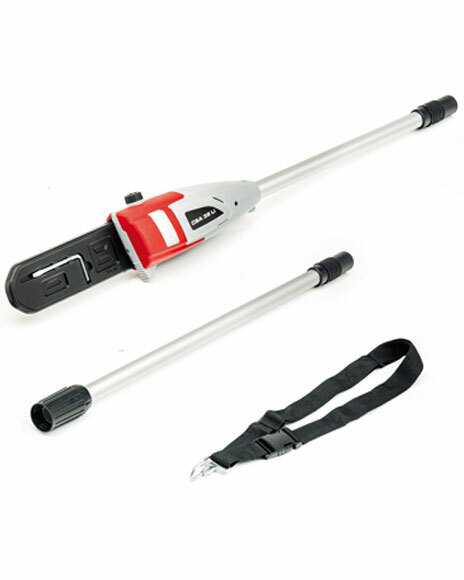 The tree pruner attachment is a chainsaw with a cutting length of 200mm. It saws at a chain speed of 4.2 meters per second. This attachment is complete with a shoulder strap for extra comfort. No strain on arms and allows you the freedom to use anywhere. Long Reach means high limbs and branches can be pruned back safely without the use of a ladder.